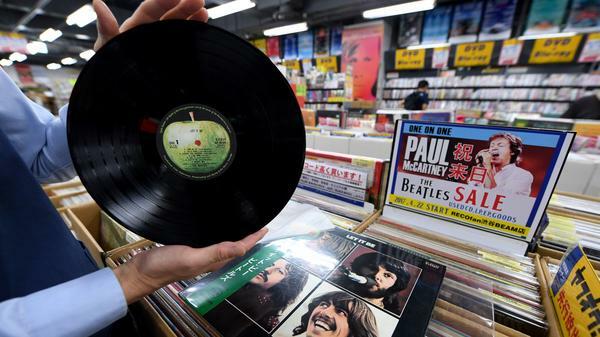 A store manager shows off a Japanese pressing of The Beatles' Let It Be at the RECOfan music shop in Tokyo's Shibuya district. Demand for vinyl records is leading Sony to restart making vinyl records. Sony Music is preparing to make its own vinyl records again in Japan, in another sign that albums are back from the brink of being obsolete. The company says it's installing record-cutting equipment and enlisting the help of older engineers who know how to reproduce the best sound. Vinyl sales have seen a resurgence since around 2008. And while records are still a small part of the market, the fact that in 2016, "a format nearly a century old generated 3.6 percent of total global revenues is remarkable," as NPR's Andrew Flanagan has reported. Years of double-digit growth in record sales have left vinyl press plants in the U.S., Japan and elsewhere struggling to meet demand. Sony's plan reportedly includes the possibility that it will press records on contract. As the creator of the Walkman and a co-developer of the CD format, Sony helped to end the era of vinyl albums. And while sales of digital music have been hit in recent years by the popularity of streaming audio on Spotify, Pandora and other outlets, Japan's Nikkei newspaper quotes Sony Music Japan's CEO Michinori Mizuno saying that when it comes to vinyl, "a lot of young people buy songs that they hear and love on streaming services." Fans of vinyl cite the rich sound it provides and say album art and liner notes give them a more tangible sense of connection to the music they love. "The way I consumed music has been so instant and so immediate, especially with Spotify and online streaming services," Veronica Martinez said. "I kind of just want to go back to the way I used to listen to it as a kid." Sony has already installed record-cutting equipment at a Tokyo studio and will start pressing records again in the spring of 2018 — nearly three decades after it made its last in-house vinyl back in 1989. "Cutting is a delicate process, with the quality of sound affected by the depth and angle of the grooves," Nikkei reports, "and Sony is scrambling to bring in old record engineers to pass on their knowledge." With the move, Sony will make records that could be played on the new turntable it sent to market last year — although we'll note that the player includes an audio converter and a USB outlet for converting songs into digital files.